WASHINGTON — A Senate panel overwhelmingly backed bipartisan legislation that would authorize President Donald Trump to put new sanctions on Iran while keeping the landmark nuclear deal with Tehran in place. The Foreign Relations Committee voted 18-3 on Thursday despite concerns from former Secretary of State John Kerry and several Democrats that the measure could nonetheless lead to the unraveling of the nuclear accord negotiated by the Obama administration. Kerry cautioned lawmakers to “tread carefully” in pushing ahead with new sanctions against Iran in the wake of President Hassan Rouhani’s re-election last week to another four-year term. Rouhani is a political moderate who scored a resounding victory over a hard-line opponent. His win is viewed by many as a referendum on his push for international outreach that led to the nuclear deal. In a series of tweets Wednesday, Kerry said “there is much up in the air/room for misinterpretation. 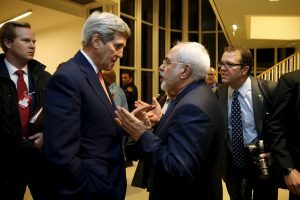 This is not the moment for a new Iran bill.” Kerry, who spent nearly three decades in the Senate and chaired the Foreign Relations Committee, urged his former colleagues to consider the risk of undercutting the nuclear agreement by imposing new sanctions. “We need to consider the implications of confrontation without conversation,” Kerry wrote. But Sen. Bob Corker of Tennessee, the committee’s Republican chairman and one of the bill’s sponsors, said he recently reviewed top-secret intelligence that detailed Tehran’s support for terrorism and other destabilizing actions. “It is astounding what Iran continues to do around the world,” said Corker, urging his colleagues to confront the threat Tehran poses. The committee’s bill imposes mandatory sanctions on people involved in Iran’s ballistic missile program and anyone who does business with them. The measure also would apply terrorism sanctions to the country’s Revolutionary Guards and enforce an arms embargo. In exchange for Tehran rolling back its nuclear program, the U.S. and other world powers agreed to suspend wide-ranging oil, trade and financial sanctions that had choked the Iranian economy. As part of the July 2015 multinational accord, Iran also regained access to frozen assets held abroad. Israel and congressional Republicans have long assailed the agreement as a windfall to Iran. They’ve argued the deal only delayed Iran’s pursuit of nuclear weapons and failed to allow the kind of inspections of its atomic sites that would guarantee Tehran was not cheating. Lifting economic sanctions saved Iran’s economy, GOP lawmakers added, and allowed the country to funnel more money to terrorist groups. Yet the nuclear deal remains in place despite Trump’s pledge during the presidential campaign to discard or renegotiate the pact. Instead, the State Department took a key step last week toward preserving the pact by issuing a waiver to keep the sanctions from snapping back into place. And the Trump administration notified Congress last month that Iran is complying with the terms of the agreement. Neither Iran nor the other nations that negotiated the agreement have any interest in re-opening the deal, and U.S. companies could lose money if the deal is scuttled. Tehran has inked multibillion-dollar deals with Boeing and Airbus since the deal went into effect. The Obama administration had opposed legislation that would slap Iran with more penalties over concerns that such a step could give Iran an excuse to walk away from the deal by saying the U.S. had reneged on its commitments to sanctions relief.